Roller banner prepared for Julie’s Bicycle. An insight into the signage prepared for a college refectory. 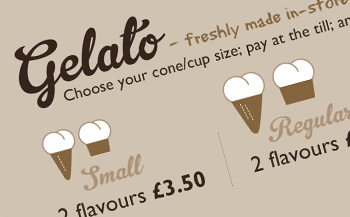 Part of the in-store graphics prepared for 3BIS Gelateria – London’s best ice-cream available next to Borough Market.